The gargantuan capabilities of this Halo have made it pretty popular for those needing a heavy lift, including a wooly mammoth. If you follow the aviation industry at all (and if you’re reading this, you probably do), then you know about the U.S. Marine Corps’ latest helicopter addition: the CH-53K King Stallion, which had its maiden flight last October. With a gross weight of 88,000 pounds, it’s now the largest helicopter in the U.S. military. The King Stallion is based on the decades-old, highly successful CH-53 Sea Stallion. But there’s a larger helicopter out there, one that can even lift a fully-loaded CH-53D. And it’s of Russian design. It’s the Mi-26, and it really doesn’t even look like a helicopter. It looks more like a cargo plane without wings and a rotor on top, and in many ways, it can carry the same loads as cargo planes like the C-130. In the mid-1960s, Russia was developing a super heavy-lift helicopter to be capable of deploying ballistic missiles to remote sites all over the countryside. The best way to describe this helicopter is by imagining the V-22 Osprey used in today’s U.S. military, but the rotors are larger and fixed in the horizontal plane. This helicopter, the V-12, was supposedly capable of lifting close to 100,000 pounds – that’s right, it could lift a CH-53K at maximum gross weight. Two prototypes were built but it never entered production. Design of the Mi-26 started shortly thereafter, as the only other heavy-lift helicopter in the Russian fleet was the aging Mi-6. The Mi-26 had similar operational requirements, that is, to deploy small ballistic missiles around Russia. Its empty weight was not to exceed half of its maximum gross weight, and it also had to be capable of carrying armored personnel carriers and amphibious assault vehicles. 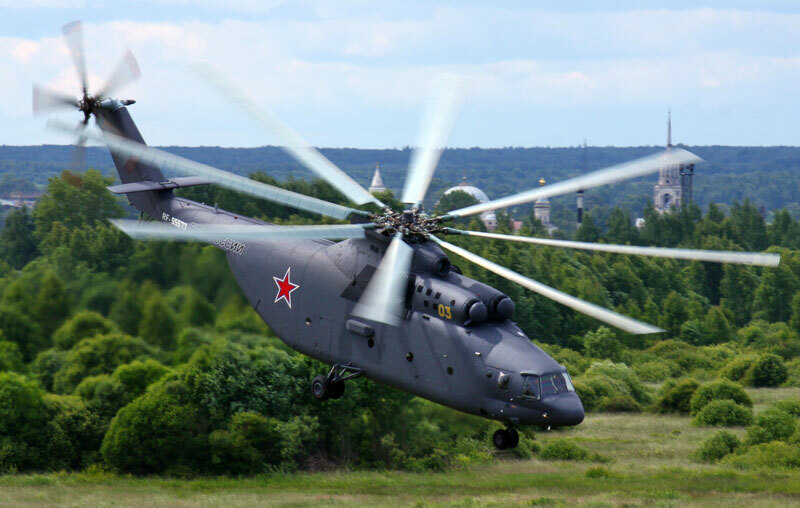 To meet this requirement, the Mi-26 was designed with an eight-blade rotor (the first of its kind) and a specially designed lightweight gearbox that split torque loading of the two giant engines. Lightweight aluminum-lithium alloys were used throughout the helicopter to reduce the empty weight. The Mi-26 ended up with an empty weight of 62,040 pounds and max takeoff weight of 123,200 pounds. The two turboshaft engines, Lotarev D-136s, have a rating of 11,400 shp each. The main rotor diameter is a massive 105 feet. To put this in perspective, the common Bell 206 helicopter has a rotor diameter of just over 33 feet, powered by a 650 shp engine. The tail rotor of the Mi-26 is larger than the main rotor of many common smaller helicopters. The Mi-26 made its public debut at the 1981 Paris Air Show and finally entered service in 1985. By the time the world’s largest helicopter did enter service, relations with the United States were improving and its requirement to deploy missiles was disappearing. There were still large roles for the Halo to fill, and the helicopter was adapted to suit these. The basic Mi-26, the “Halo-A”, has no offensive weapons but it does have a variety of defensive countermeasures, mostly infrared decoying for heat-seeking missiles. It can carry two armored military vehicles or 90 light combat troops. The standard crew is four: a pilot, co-pilot, flight engineer, and navigator. An additional folding seat in the cockpit will also hold a flight technician if required. Loading is through a clamshell door in the aft of the cabin and a loading ramp that can be raised or lowered hydraulically to facilitate loading. There are two electric winches on the overhead cabin compartment to position payloads; these winches are on sliding rails to be repositioned throughout the cabin. The Mi-26T is a civil freight version, introduced the same year as the military version. There’s really no difference between the civil and military versions except for their roles. It was just announced last year, however, that this variant has been upgraded and now on the production line as the Mi-26T2. An extensive glass cockpit and instrument modernization eliminates the flight engineer and navigator stations while allowing the helicopter to operate day and night, rain or shine. Engines have also been upgraded to the D-136-2 turboshafts, with full electronic controls delivering 12,500 shp in emergency situations and improved operating characteristics in hot environments. Preliminary reports are that the payload may be increased from 44,000 pounds to 55,000 pounds. The Halo was also well suited for a medical role. The Mi-26MS is a medical variant of the Mi-26T. Now just visualize fitting all of this into a helicopter: an ICU for four patients, operating room for one patient, pre-op station for two patients, ambulatory section with five stretchers, three seated patients, ten medics, and a medical laboratory. This helicopter can be fitted with various configurations for up to 60 stretcher patients. Many of the other Mi-26 variants include a firefighting version, aerial crane, and fuel tanker. One other, the Mi-26S, was quickly adapted to respond to the Chernobyl disaster. Thirty of these helicopters were equipped with apparatus to drop insulation on the leaking reactor and shielding & filters in the cockpit for the crew. The gargantuan capabilities of the Halo have made it pretty popular for those needing a heavy lift, including a wooly mammoth. A Halo lifted a 50,000-pound block of ice containing a 23,000-year-old wooly mammoth out of the Siberian tundra in October 1999. The weight exceeded the design limits of the Mi-26, so this helicopter had to be promptly inspected for airframe warping after the mission. A civilian Mi-26 was also leased by the U.S. military to lift a couple of damaged CH-47 Chinooks at various times in Afghanistan. I watched a Chinook lift a damaged Blackhawk once, I can’t imagine another helicopter lifting the Chinook. But fortunately, someone got it on video! The Mi-26 was also a perfect fit for disaster recovery following the massive 2008 earthquakes in China. The helicopters transported earthmovers to remote areas inaccessible to any other kind of machine. These earthmovers were then used to clear landslides holding water that threatened the lives of millions of people downstream. I’d say that the Mi-26’s capabilities won’t be topped for a while, but I might be wrong. 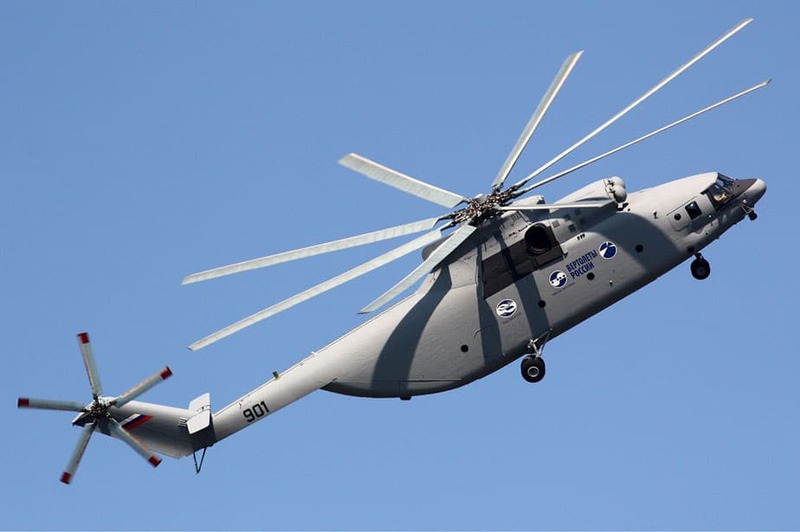 China and Russia just entered into an agreement to develop a helicopter with twice the lifting capability as the Mi-26, putting it near the original V-12 capacity. I’m interested in following these developments to see what they can design. Still, the Mi-26 is very relevant, as proven by last year’s introduction of the Mi-26T2. Since the early 1980s, over 300 Mi-26s have been built and put in service with different militaries throughout the world, not to mention the many civilian operators using it in construction roles among other things. If you need the payload capacity of a C-130 but don’t have the runway for it, get a Mi-26.